Please leave any food inside the coach as it is not allowed inside the monkey park. The park is a great place for school groups of all ages to explore. 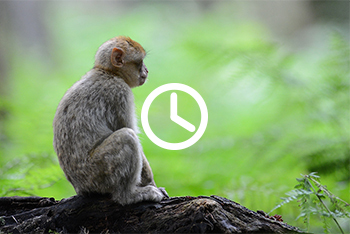 Our monkeys live in similar conditions as they would in the wild, enabling the students to study social behaviour, diet, life cycles and conservation. Our aim is for students or school children to enjoy their visit, have fun and learn at the same time. 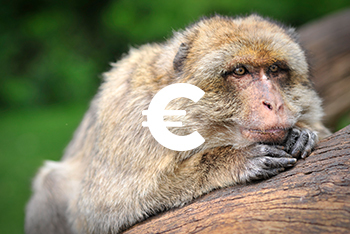 Our mission is to share our knowledge of the Barbary macaques. Education is a key element of the park, we are keen on sharing our passion for the monkeys by raising awareness about their vital needs, their social organisation and the urgent need for protection of the species. 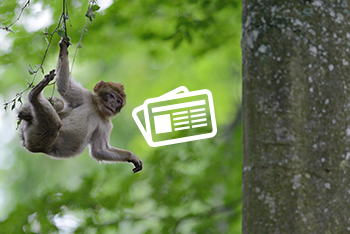 A variety of teaching resources are at your disposal to help get the most from your visit: video (showing the Barbary macaque throughout the seasons), interactive boards along the path, educational booklet and information centre (located just outside the monkey park), quiz and feeding talks. The pathway that runs through the monkey enclosure is 1 Km long. The trail is wheelchair friendly, however, due to some steeper slopes some wheelchair users do find the steeper areas inaccessible. Please ask for a map at the entrance kiosk.